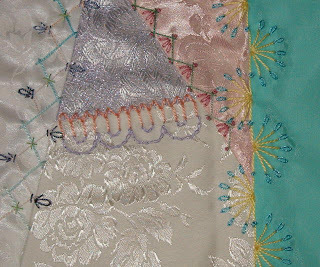 Okay, so I'm really into seam embellishments lately. First, I was scared to death...and now, I can't get enough! I have these nifty little plastic templates to help space the stitches evenly, and they helped me to overcome my fears. I applaud the lady (cause you know it had to be the Mother of invention) for making these, and hope that she sells millions and millions of them! If you're interested in learning about them, they are found at embroiderysuccess-strips.com And, no...I don't know the lady that sells them...and no, I don't get some kind of kick-back for promoting them. Just think that anytime someone does something good in the world of quilts I live in, it should be applauded. :) Now, as with just about any part of my creative life...I'm just not satisfied with staying in one place. I like to move about, shake up my mind...and explore. 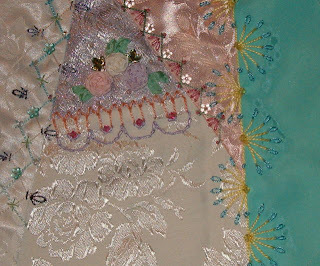 And, seam embellishment is no different...so, it is no great surprise to me that using these little templates gave me more, and more ideas. And, the fact that I am a lazy daisy...when I see a faster or easier way...I just have to go for it! Hence, my creation of my own set of templates. No, I'm not trying to market them...just trying to explain my process. 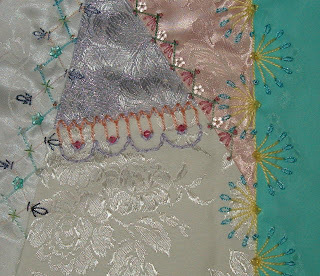 And, perhaps, it will help you to find your way into a faster and fun filled adventure of seam embellishment as well. 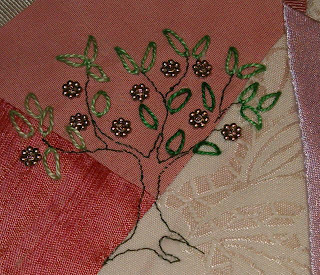 I created these little templates that I use by drawing some of the more familiar embroidery stitches...precisely...and printing them out on plastic. Now, it was not an easy task...since I can't draw a straight line, and I don't have any fancy dancy software to do this with. I used plain on Excel spreadsheet...yep, I'm crazy! I use Excel for drawing my layout for shadow appliqué designs (okay, that's another post...yet to be written) because the "cells" can be made the same height and width...like grid paper...and I can draw lines up, down, and diagonal. Not very efficient I'm sure; and REAL computer folks are probably having visions of cavemen and stone tablets right about now...but, for me...it works. Anyway, I digress... now I have these grided stitch charts. And, I print them out onto plastic sheets as though I was going to do an overhead projection. Then, I cut them out in rows with my rotary cutter. Now, the real tedious part begins...I use a hand held hole punch and make a hole for every spot my needle would go into. Like, for an X..I might just do the four corners...or them and the center. The hole is very tiny, and I got the hole punch in the scrapbook section of Hobby Lobby…they are the ones with purple handles. So, now…I lay these plastic stitch templates on my block…and with a lead pencil, mark a tiny “dot” in all the holes. That’s how I know where to put my needle. And, the seam looks mostly uniform when I get done! They aren't perfect, since I created them and no robot cut them out...but I'm happy with them. 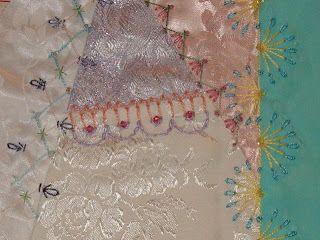 From here I can do some basic stitches...then add a little more to these stitches with lazy daisy, french knots, X's, etc. Then I add beads, usually Swarovski crystals because I love them, or some flowers beads. 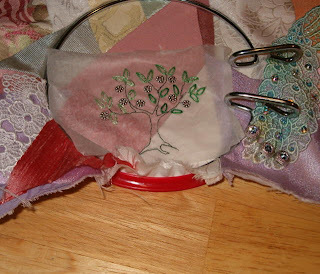 Next, comes silk ribbon or buttons or more beads...or lace, or ribbon..you get the idea. I've included photos of my latest project...from the basic first stitches using my templates...to the additional steps until I get the finished crazy patch block completed. Feel free to copy any of my ideas, because they are just part of a long tradition of stitches that are surely not my creation...and I would love to hear about your efforts. If you don't have a group of stitchers to support you...come on over to the HGTV message board for quilting and needlework and join us. There are ladies on this site who know far more than I do about crazy quilting!...but can’t be having any more fun than I am…cause I’m loving it!! I've been working on some Christmas projects. Can't say a lot...cause they are a secret! Sssssh...but here's the first one completed. It looks a little lopsided in the photo...but is really pretty smooth. Reminds me of a dough right before you plop it in the pan to bake. 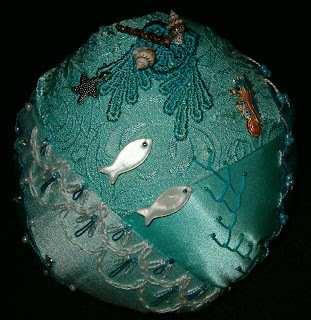 And, while I'd love to say the idea for these pincushions was mine...because it is brillant...but, alias that is not so. 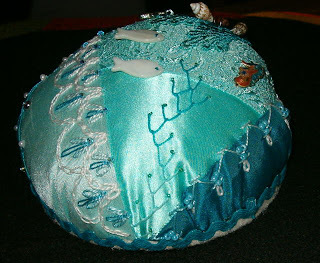 They belong to a wonderful CQ wonder artist!...her blog is http://ivoryblushroses.blogspot.com and the pattern/instructions are in the blog titled "Sea Dreaming'. If I was more computer savy I'd put a link in here for you...but, you'll just have to search this out for yourself! 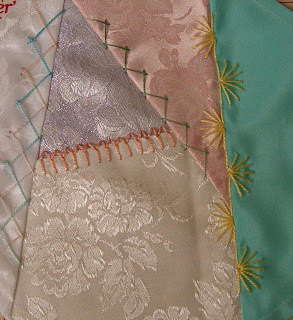 Today, I figured out how to do a very simple thing on a crazy quilt project I'm working on. And, it just made my entire day go so much better! Now, I'm sure there are millions of women who would have concluded this long before I finally got around to it...but, that doesn't make it any less sweet that I have finally accomplished it! I've really be stumbling along trying to figure out how in the world to transfer a design...easily...to a CQ block if I couldn't iron on it. I can't claim to have even thought this up myself...as one of my wonderful cyber buddies beat me to it...but, that doesn't bother me one bit. For the flowers, I used tiny spacer beads with a tinsy little #15 seed bead (rocailles) in the center to hold the spacer down. Viola!! A masterpiece....well, at least Me and my Mom love it!